eBay has been pushing out quite a lot of short-term discounts in the last year, and just in time for your final pre-Black Friday purchases, we have another. Until 8PM tonight, you can get 15% off your purchase up to a maximum $100 discount via a coupon code. But there's one major catch: you have to make the purchase via the eBay app. Full terms and conditions for the deal, as well as more verbose redemption instructions, are available here, but the short version is that there's no minimum purchase required, and some things like warranties, protection plans, gift cards, money, cars, and real estate are excluded. Past around $670, you don't get any additional discount, so if you're after the maximum possible savings, the best things to target are items like this unlocked, dual-SIM S9+ or $100 off, or an already discounted Note9 direct from Samsung. You won't get the full $100 max, but there are some other good deals too, like a 3rd gen Nest thermostat for $170, an Nvidia Shield TV for $119, or even a PS4 with the new Spider-Man, Horizon Zero Dawn, and XCOM 2 for around $225 when all is said and done. 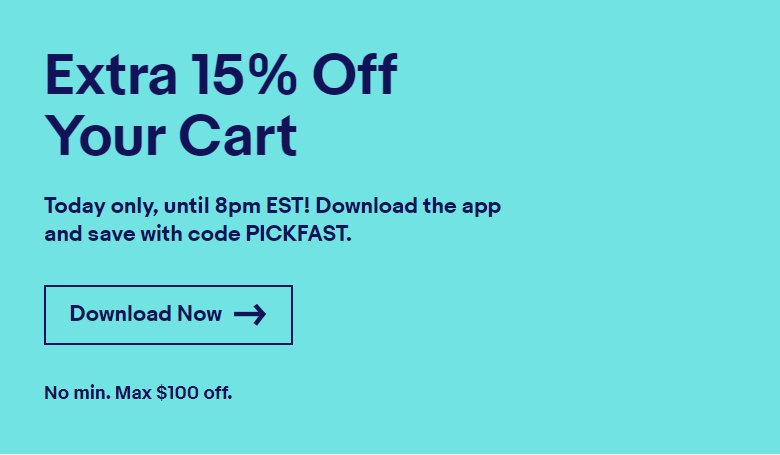 When you're ready to check out, remember that you need to do it from your phone, and just enter the code PICKFAST at checkout.